The number of views for Davao’s international airport spiked a few days ago and from the responses to the posting on Facebook, it’s clear that people are appreciative of good infrastructure provided to them. People in other cities expressed similar or related feelings in relation to the post with many expressing that they hoped their city could have a good airport. Well, we know at least that Iloilo and Bacolod have good airports in Cabatuan and Silay that are now serving international flights as well. Hopefully, we’ll have more airports upgraded like Tacloban, Tagbilaran, Legaspi and Puerto Princesa that are all very crowded as more people fly to these cities including tourists whose numbers are steadily increasing. Cebu’s airport expansion is up for bidding and Northern Mindanao will soon have a large airport opening at Laguindingan. Cagayan De Oro’s Lumbia Airport will eventually be phased out. Meanwhile, here are a few more photos on DVO from a recent trip I had. 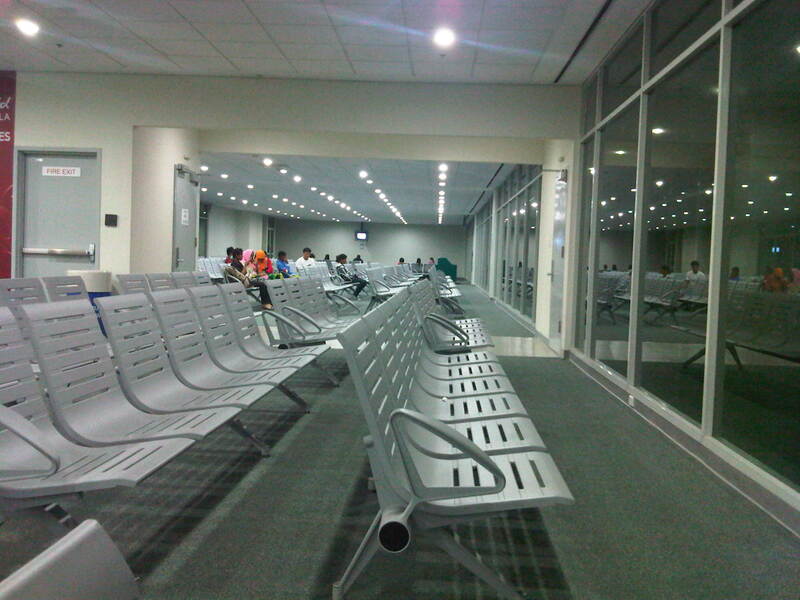 The spacious terminal is desirable for large cities like Davao and generally serves the entire region. Another look at the spacious pre-departure area at Davao’s airport – I assume that the area can become full if the aircraft happens to be a widebody like the B747 or A330. I am curious to see how much of family expenditures go to transport. Clearly, the state of the country’s transportation system is a significant factor in development and the government’s initiatives towards inclusive growth will not prosper if we continue to have inefficient transport across all modes for both people and goods. I chanced upon the demonstration run of an articulated bus for the Department of Transportation and Communications (DOTC) and participants of a workshop on crowd-sourcing that was being conducted that day. After seeing the interiors of the bus, I decided to ride in a vehicle following the bus to take a few photos of the vehicle and also catch the reactions of people along the street who might be seeing an articulated bus for the first time. The demo run (and others in the future) should give people an idea of what road transport still has to offer in terms of vehicles that could carry more people. I like the look on people along the streets that the bus passed along. Some were scratching their heads and others had to have a second look (double take) at the long vehicle. Articulated buses are not new to public transport operations. Singapore’s SMRT operates many of these buses along busy routes. Below is a photo of an articulated bus passing in front of the Central Fire Station across the Funan IT Mall. There are other types of buses in service in cities in other countries such as double deckers, and bi-articulated buses (equivalent of about 2.5 regular buses). These buses require skilled driving to ensure safe operations including maneuvering at intersections and terminals. The buses should be suitable for routes with passenger demands between those requiring regular buses and rail transit like routes that can be designated for bus rapid transit (BRT), and with scheduled stops. I am quite optimistic about the future of public transport in Metro Manila and other cities where buses should play a significant role for mass transport. The Luzon Avenue flyover spanning the width of Commonwealth Avenue is now open to two way traffic. Previously, only the northbound side was open, allowing vehicles to cross Commonwealth from Tandang Sora Ave./Katipunan Ave. to Luzon Ave. and towards Congressional Avenue. I took a few photos of the flyover and the vicinity of Luzon Avenue en route to NLEX a few days ago. The Luzon Avenue flyover has a total of 4 lanes, divided by a median island. The lamp posts indicate a well lighted road during night time. The pedestrian walkways on either side are quite narrow and I think the designers of the flyover could have widened this feature of the facility. A view of Commonwealth Avenue from the flyover. Along the other end of the flyover is Luzon Avenue, which has been widened to accommodate the flyover and the at-grade sections connecting to the QMC-bound side of Commonwealth Avenue. A pedestrian overpass was constructed at the foot of the Luzon Ave. flyover so pedestrians will not cross at this critical part of the flyover when vehicles would typically be picking up speed as they descend (or ascend on the other side) the flyover. 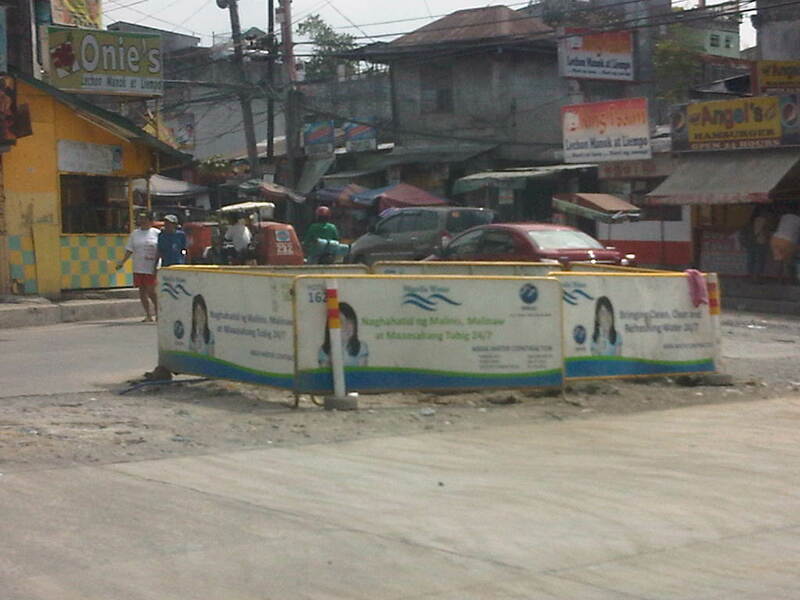 There are still construction work along the northbound side of Luzon Avenue. Luzon Avenue, which is a 6-lane, 2-way road divided by a median, is quite crowded with either side of the road occupied mostly by informal settlers. 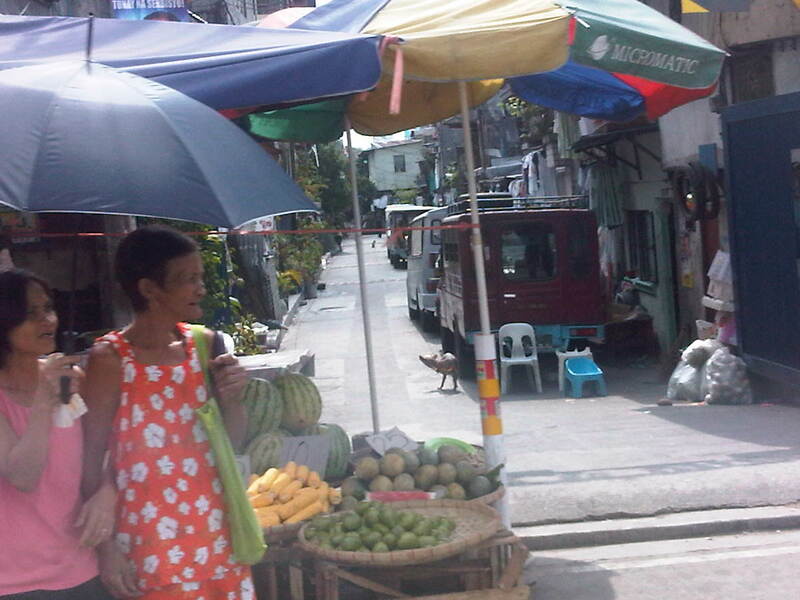 There is also an informal wet market (talipapa) along the road. The pavement is elevated compared to the land on either side of the road. There are stores and shops set up by those living along the road. Side streets are narrow and could probably accommodate only cars or small vehicles like tricycles (also shown in the photo traveling along Luzon Ave. Some stalls are just along the street like this fruit stand that’s already on the carriageway. The photo also shows a better view of a side street with parked vehicles along one side of the road. Approach to Congressional Avenue – there is another pedestrian overpass near the junction with Congressional. Note the height of the plant box on the median that is designed to discourage or minimize jaywalking across Luzon Ave.
Water works at the junction of Luzon Ave. and Congressional Ave. Luzon Ave. continues as a narrow 2-lane street towards the direction of Bgy. Holy Spirit. UP Teachers Village in Quezon City is a good example of a residential area that has been transformed over a few years. This transformation was enabled mainly by its streets, particularly Maginhawa Street, being open to general traffic. Teachers Village roads are often used as short cuts between major roads like Commonwealth Avenue and C-5/Katipunan (via C.P. Garcia Street), and Elliptical Avenue, Kalayaan Avenue and V. Luna. Due to both significant foot and vehicle traffic, what used to be homes along the streets have become restaurants, shops, offices, or even schools. There are many cases of homeowners who have found their houses less livable due to the noise and air pollution attributed to traffic (Note: There are so many tricycles in the area.). These have sold their property to people who used it instead for business. Unfortunately, despite the approval of the local government of the changes in land use, most establishments clearly have not satisfied basic building code requirements such as those for parking and pedestrian facilities. Schools and commercial establishments like restaurants and shops are found along Maginhawa Street. Most do not have adequate parking spaces for customers. Maginhawa Street has been widened to accommodate more vehicular traffic. Unfortunately, widening the road has only led to more on-street parking as shown in the preceding photos. People also are often forced to walk along the carriageway because because sidewalks are usually blocked, with some establishments using the space for al frresco set-ups. Developments need to be inspected to check if they comply with basic requirements such as parking and pedestrian facilities. Development and land use changes can be justified but proponents must be made to comply with the minimum requirements of the National Building Code in order to mitigate potential impacts to the community. The Manila North Tollways Corporation (MNTC) recently donated software and equipment to the University of the Philippines Diliman’s Road Safety Research Laboratory (RSRL) at the National Center for Transportation Studies (NCTS). Gracing the Turnover Ceremony were no less than MNTC Chair Manuel V. Pangilinan and UP System President Alfredo E. Pascual. Dr. Hilario Sean O. Palmiano, the current NCTS Director, welcomed guests from MNTC and its parent firm Metro Pacific Tollways Corporation as well as from UP and the media. Dr. Ricardo DG. Sigua provided a background on the RSRL and how the donated equipment would help in the implementation of researches. The following photos show some highlights of the Turnover Ceremony last April 11, 2013. UP President Alfredo E. Pascual shaking the hands of MNTC Chair Manuel V. Pangilinan after they delivered messages during the Turnover Ceremony held at the NCTS. Looking on are Road Safety Laboratory Head Dr. Ricardo Sigua and NCTS Director Sean Palmiano. MNTC Chair MVP making a point about the microsimulation demo as UP Pres. Pascual looks on. Tarps on display showing a list of donated software and equipment, photos of technical cooperation and capacity building between NCTS and MNTC/MPTC, and the advocacies of NCTS.